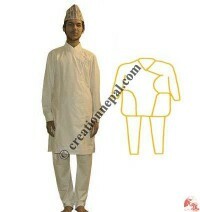 Nepali male costume Daura Suruwal or Labeda-suruwal has its own characteristics. The use of eight strings, closed neck and hip covering length of Daura are considered as its religious values. Naturally comfortable to wear and typical design are the main attraction of this costume. Daura Suruwal itself is not everything; a Nepali cap called Dhaka Topi, a coat and a pair of black color leather shoes also requires completing the Nepali dress. The history of the dress goes back to hundreds of years but it was declared as the national uniform for men in government positions only in 1960. Creation Nepal offers Daura Suruwal including Dhaka Topi in 4 different sizes. How do I know the right size of Daura Suruwal for me? 2 Dui Number (Daura: Chest 34.5 inch, Waist 34 inch, length 34 inch and sleeves 22.5 inch and Suruwal: length 38 inch, Pidaula 14.5 inch, Mohta 12 inch). 5 Panch number (Daura: Chest 42 inch, Waist 42 inch, length 38 inch and sleeves 24.5 inch and Suruwal: length 40 inch, Pidaula 17 inch, Mohta 13 inch).